Lost in Transcription Has Moved!! : What's the plural of "octopus"? So, how do you refer to more than one octopus? "Octopuses"? "Octopi"? "Octopodes"? In case you're uncertain which way to go, here's a handy guide from Darwin Eats Cake, which you can print out for easy reference. Some of you may recall this video from Kory Stamper, who argues that "octopuses" is fine, as is "octopi," as is "octipodes," for that matter, although, as she says, if you're going to use it, you'd better be prepared to explain and defend it. I think that's all dead on, with one small addition. Stamper argues that when a word is borrowed into English, it gets the standard english pluralization, hence "octopuses." I feel like there actually is a living grammatical rule in spoken English, where you are allowed pluralize a word ending in "us" by changing it to "i" provided that the word is long enough, and especially if the word sounds sort of foreign-ish. Now, I mean "allowed to" in a descriptive, rather than a prescriptive sense. That is, I take the viewpoint that if I say a word (or a phrase, or use a grammatical construct, etc. ), and most native English speakers understand that word in roughly the sense in which I meant it, then it's a part of English, whether or not it follows a rule that has been codified in a book. So, if I were talking about more than one Krampus, and I used the word "Krampi," I think that most people would understand what I meant (assuming that they had heard of Krampus in the first place). On the other hand, if I drop by an elementary school and start talking to the children about the line of yellow schoolbi, I'm probably going to get arrested. From where I stand, then, "octopuses" and "octopi" are both native English pluralizations. 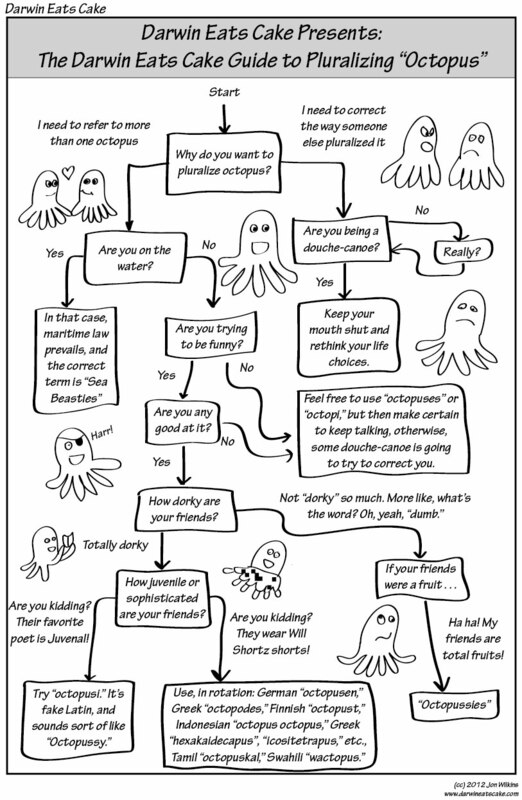 "Octopi" just happens to use a rule that came into English through an appeal by (prescriptive) grammarians to Latin. "Octopodes," by contrast, will only be comprehensible to someone who either has studied Greek, or who has had this particular debate pointed out to them. The poet in me feels the need, of course, to point out that there is no such thing as an exact synonym (blah, blah, blah). So, while "octopuses" and "octopi" both refer to more than one octopus, they don't mean the exactly the same thing. In particular, if I say "Look at the octopi," I am really saying something like "Look at the more than one octopus, and, hey, I'm doing that Latin thing." Whichever one you use, there are aspects of social positioning involved (maybe I want to look smart, or educated, or maybe salt-of-the-earth-ish, etc. ), the details of which are going to depend a lot on the specifics of the social context in which you're talking. 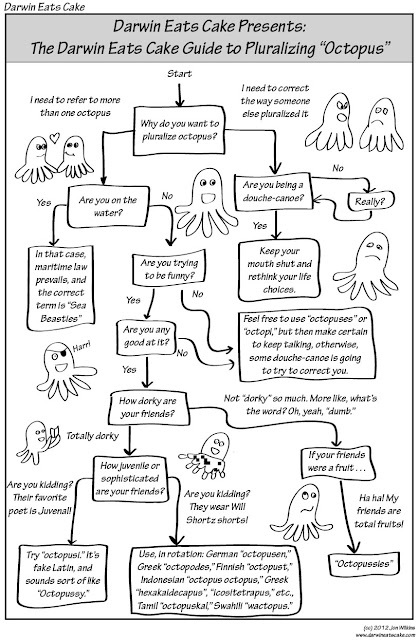 Really, pluralizing "octopus" is the third rail of talking about cephalopods (cephalopodes? ), in that there is no way to do it where someone in the room is not going to make an issue out of it. I also feel like maybe I should clarify what I perceive to be the game in the dorky/sophisticated outcome. The goal is not necessarily to implement pluralization as it would be done in language X by a native speaker of language X. Rather, it is to take a simple pluralization rule from language X, remove it from its native context, and implement it in English, sort of like the Krampus / Krampi thing. It's like trying to figure out how to pluralize something in a sort of Xglish (the language-X analog of Spanglish). For example, David Winter (@TheAtavism) points out that in Maori, one octopus would be "Te wheke," while two or more would be "Nga wheke." I take that to imply that the appropriate Maoglish plural of "octopus" would be "ngactopus," which is pretty fun to say. @symbolicstorage notes that the same ambiguity exists in German, where one might say "oktopusse" or "oktopi," adding that "octopusen" is 100% wrong. But, you know, I don't know about that. It only looks about 20% wrong to me. 30% at most. 100% wrong would be more like "farfegnugen." @BobOHara says that Finns would most often use the partative form "octopusta," rather than the plural "octopust." I still don't fully understand the distinction, but is seems that "octopusta" would best be translated something like "some octopus, like probably more than one, but I'm not going to count them right now, since I have better things to do, like participate in my world-leading public education system." And "Kraken-wrangler" @DrSeaRotmann suggests "octoposse," which is the only plural I am going to use from this day forward. Have you got more? How do you say "octopus" in your native (or secondarily learned) language? How do you refer to more than one? And, how would you create an English hybrid (Xglish plural) using that pluralization rule? Post in the comments, or send a note on Twitter (@jonfwilkins), and I'll update the list! Oh, and by the way, I forgot to include the French "octopeaux." The Swahili word for octopus is the same for both the singular and the plural: pweza. The m/wa singular/plural prefix is mostly associated with the people noun class, if that's how you created 'wactopus'. Oh, I see that's exactly what you did to get 'wactopus'. Nice. So, the pweza thing, is that part of a class of nouns for which the singular and plural are always the same, or is it irregular? As for the German part, I'd probably use "Oktopoden", though admittedly this looks like a German-Greek crossover. But still better than "Oktopusen" oder "Oktopussen", which, by the way, looks more Norwegian or Swedish to me. There is an excerpt online somewhere from a book of fiction in which a man goes into great detail in explaining the proper way to pluralize Octopus, and why Octopi is incorrect, after his son makes a bad grade on a paper on which the teacher did not mark any corrections. When called out on it, she insists that octopus is improperly pluralized, but cannot give any examples of any other mistakes in the paper. Wish I could remember what that book was - I wanted to get the whole thing and read it. Meh. Someday I'll search it out again. Clarification re: "Hot like Mexico"